HORAL is organising the next edition of the Toer de Geuze on Saturday 4th and Sunday 5th May, 2019. The following breweries and blenderies will be open on Saturday: Boon, De Troch, Lindemans, Oud Beersel, Tilquin, Timmermans and the visitor centre De Lambiek. De Cam, Hanssens and Mort Subite will NOT be open on Saturday. The following breweries and blenderies will be open on Sunday: Boon, De Cam, De Troch, Hanssens, Lindemans, Mort Subite, Oud Beersel, Tilquin, Timmermans and the visitor centre De Lambiek. The entrance to all participating breweries, blenderies and the visitor center De Lambiek is FREE OF CHARGE. One does not need to make a reservation to visit a brewery or blendery. 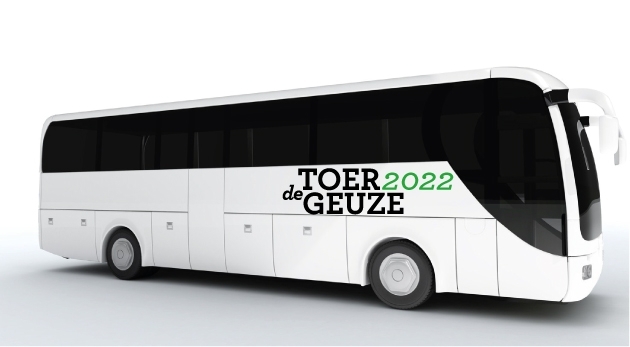 One can do the tour with one's own means of transport (car, bike...), or one can book a seat on one of the Toer de Geuze coaches. and also the visitor centre De Lambiek, Gemeenveldstraat 1, 1652 Alsemberg (Beersel). Brewery Boon is open all weekend, on Saturday from 11 am to 9 pm and on Sunday from 10 am to 6 pm. During the visit you can also enjoy a free tasting lambic between the oak barrels. Boon's beers as well as the Oude Geuze Megablend 2019 can be tasted at the various bars. Special bottles of gueuze from the Boon reserve will be available in the special taster bar. For those who are hungry, there is warm ham, tripe sandwiches, sandwiches with country cheese an other food. In the brewery shop, all beers and beer glasses are also for sale. You can park on the parking area opposite the brewery. If you travel by train, you should get off at Lembeek station. The brewery is located at the south exit of the station. Are you getting off in Halle or do you come from Halle? Then you can also hop on the boat between Halle (Suikerkaai) and Lembeek. At De Troch, in addition to a guided tour with tasting, you can also go for a sandwich with Wambeek country cheese or with farm ham. There is a beer shop and a beer terrace. There is a bouncy castle for the youngest. Food will also be served in the nearby brasserie De Wijze Expression, which will present specially prepared dishes for the Toer de Geuze with beers from De Troch. Combine your visit to the brewery with the walking route Pol De Mont and / or the cycling route the Boerenkrijgroute, both with junctions at brewery De Troch. At Hanssens (ATTENTION: ONLY OPEN ON SUNDAY 5 MAY) the Hanssens VSOR (Very Special Old Red), a special blend of a mix of red fruits (strawberries, raspberries, cherries and blackcurrants) with old lambic will be launched. At the same time, you can visit the exhibition of works by the local painter Patricia Horvath. Roasted pig will be served prepared, as well as snails in geuzesoep, homemade dried sausages with Gueuze Hanssens, meat balls in tomato sauce and also sandwiches 'without meat'. At Lindemans one can witness the brewing process, because Lindemans will actually brew lamb. There will be guides available, and also the brewers and experts will be present to answer all questions about the mystery of lambic. Lindemans is organising during the Tour de Geuze a ‘Blend Your Own Gueuze Experience’. It was organised for the first time at the Tour de Geuze 2017 and it turned out to be a huge success. While the parents immerse themselves in the numerous stories of the brewery and the beers, Lindemans also provides some activities for the children. At the bar one can taste the Lindemans beers, and those who are hungry can also eat something. At Mort Subite one can visit the brewery and discover the Mort Subite beers (ATTENTION: ONLY OPEN ON SUNDAY 5 MAY). Try the Limited Edition Oude Kriek with Schaerbeek cherries, taste different vintages Old Gueuze to fully experience the effect of aging in the bottle, or taste some old lambics straight from the massive wooden barrels. Every visitor receives a free drink. One can enjoy the necessary delicacies and there is also entertainment all day long. Oud Beersel will open a pop-up bar in the former Bierhuis Oud Beersel, next to the brewery. In addition to the HORAL Megablend, new Lambic beers from Oud Beersel will be presented, and one can taste different new collabs with national and international breweries. Oud Beersel will offer all visitors a free lambic taster during the tour. One can visit the Schaerbeek cherry orchard behind the brewery. When visiting Oud Beersel one can savour some Burgundian treats such as roasted pork marinated with lambic and sandwiches with quality meat from Farm Cuvry. On Saturday there is a free performance of the music group Tram 58 between 2 pm and 5 pm. For the children there will be a bouncy castle and a make-up stand while the adults can enjoy a delicious glass of beer at the bar. In the brewery shop one can buy, among other things, the special Old Geuze which was released at the occasion the 137th anniversary of the brewery, a new Barrel Selection Oude Geuze as well as the Megablend 2019. Lambics will also be available in the innovative Beer Box. There is ample parking space along the Hendrik Consciencestraat, the street opposite to Oud Beersel. On the Kiss & Ride zone you will be able to stop your car to load your shopping purchases. Buses can be easily parked along the Sanatoriumstraat, which will be a one-way street this during Tour de Geuze. During the days before the Toer de Geuze, the Geuzen of Oud Beersel will provide the opportunity for tours. Please contact them via visit [at] degeuzenvanoudbeersel [dot] be. Gueuzerie Tilquin offers a free lambic taster to all visitors. At the blendery one will be able to taste all Tilquin beers. Tilquin will offer a wide range of food: roasted pig, gourmet burgers, a plate with farmhouse cheeses made from raw milk, a sandwich with white cheese, and other delicacies. All Tilquin products are sold in the shop. Timmermans dates from 1702 and is the oldest lambic brewery in the world. During the Toer De Geuze there will be actually brewed. One can discover in the morning the authentic mill from 1911 and the steaming open brewing kettles. Shortly after noon, the boiling wort is pumped to the coolship. One can also visit the unique barrel room. During the tour one can enjoy a delicious glass of lambic. Some classics from the Brussels cuisine are offered, including sandwiches with meat or country cheese, as well as ice creams based on the Timmermans beers. There will be also some music and the possibility to purchase beers and gift items. 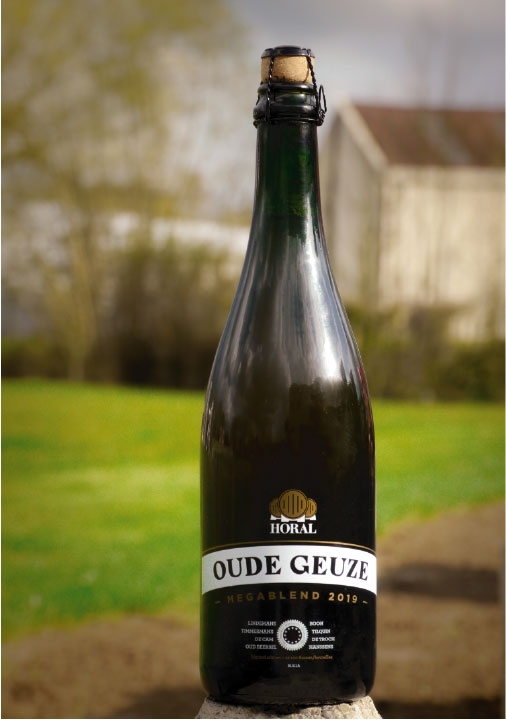 At the occasion of the 12th Toer de Geuze, HORAL presents the HORAL Oude Geuze Megablend 2019. This oude gueuze is a blend of young and old lambics of Boon, De Oude Cam, De Troch, Hanssens, Lindemans, Oud Beersel, Tilquin en Timmermans. If you also want to taste this Megablend, you can buy bottles during the Toer de Geuze at the HORAL members who contributed to the Megablend (Boon, De Oude Cam, De Troch, Hanssens, Lindemans, Oud Beersel, Tilquin en Timmermans) or order a box of 12 bottles via megablend [at] horal [dot] be. Shipping cost will be added. Oude Geuze Megablend 2019, 75 cl, EUR 9.50. On 4 and 5 May 2019 you can put your tent on the football field at the visitor center 'De Lambiek' located at the Gemeenveldstraat 1, 1652 Alsemberg. You can purchase a camping ticket from Friday 3 May from 6 pm until 8 pm and on Saturday from 10 am until 6 pm. The campsite closes on Sunday at 2 pm. A camping ticket (for a camping area of 4 x 4 meters) costs € 25.00 (cash) of which € 15.00 deposit. We also provide places for mobile homes (the location will be announced later). If you want to reserve a place, please write to visit [at] beersel [dot] be or call +32 2 359 16 36. Breakfast is also possible on Saturday 4 and Sunday 5 May (breakfast can be booked in advance via visit [at] beersel [dot] be). This temporary campsite is an initiative of the visitor center De Lambiek and the municipal administration of Beersel. The regulation and complete information can be found here. When will the next Toer de Geuze be? 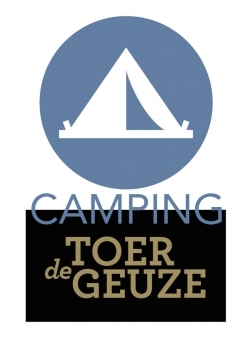 The 12th edition of Toer de Geuze will be organised on Saturday 4th and Sunday 5th May 2019. The opening hours are on Saturday from 11 AM until 7 PM and on Sunday from 10 AM until 5 PM. What breweries and blenderies will be participating? The following breweries and blenderies will open their doors for you on Saturday: Boon, De Troch, Lindemans, Oud Beersel, Tilquin, Timmermans. De Cam, Hanssens and Mort Subite will NOT be open on Saturday. The following breweries and blenderies will open their doors for you on Sunday: Boon, De Cam, De Troch, Hanssens, Lindemans, Mort Subite, Oud Beersel, Tilquin, Timmermans. Visitor center De Lambiek will be open on both Saturday and Sunday. Is it possible to visit all participating breweries and blenderies in one day? No, it is practically impossible to visit all locations in 1 day. Visiting 4 or 5 locations in 1 day is already a big accomplishment. In order to fully enjoy your visit to all breweries or blenderies we recommend to stay a weekend in the Pajottenland and Valley of the Senne. Do I have to pay for entrance? No, you don’t have to pay to visit the participating breweries, blenderies and the visitor center De Lambiek during the Toer de Geuze. The entrance is free of charge. Do I need to make a reservation to visit a brewery or blendery? No, you don’t need a reservation to visit the breweries or blenderies. Can I use my own means of transport? Yes, you can use your own means of transport (car, bike…). No, there are no signs guiding you while doing the Tour de Geuze-route. It’s recommended to use a GPS or Waze. *Only open on Sunday May 5th 2019. Are their Tour de Geuze coaches? Yes, you can book a ticket for one of the Horal coaches. Do I have to book a ticket for the HORAL coaches? When will the bus ticket sales start? What does a bus ticket cost? The price of one bus ticket is 16 EUR (transaction costs excluded). How much are those transaction costs? What are the different routes and timetables of the HORAL coaches? Visit www.toerdegeuze.be for the needed information. When do the HORAL coaches leave on Saturday? The busses depart at 10:30 AM sharp. The busses depart at 9:30 AM sharp. Is it possible to visit 8 different breweries and blenderies during the Toer de Geuze weekend with the HORAL coaches? Yes, whoever wants to visit 8 different breweries and blenderies on Saturday and Sunday from the same departure point (train station Halle) can choose the following combination: Saturday ROUTE 1 + Sunday ROUTE 9. The first Toer de Geuze was organised on 19th October 1997. Boon, De Cam, De Troch, 3 Fonteinen, Lindemans and Timmermans opened their doors for the public. Since then the open brewery day of the Payottenland and the Valley of the Senne has become a biannual event. The previous editions of the Toer de Geuze took place on 3rd October 1999, 22nd April 2001, 27th April 2003, 3rd April 2005, 22nd April 2007, 26th April 2009, 1st May 2011, 21st April 2013, 3rd May 2015, and 6th and 7th May 2017.